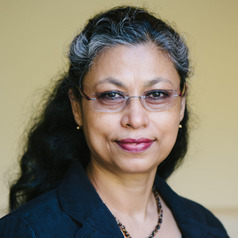 Dr. Joyashree Roy is currently the Professor of Economics at Jadavpur University, Kolkata in India. She initiated and also coordinates the Global Change Programme and Ryoichi Sasakawa Young Leaders Fellowship Fund Project on “Tradition, Social Change, and Sustainable Development: A Holistic Approach” at Jadavpur University. She was a Ford Foundation Post Doctoral Fellow in Environmental Economics at the Lawrence Berkeley National Laboratory, California , USA. She is one of the two Coordinating Lead Authors of the Industry chapter of the (IPCC) Inter-Governmental Panel on Climate Change (AR4, AR5). She has been involved in preparation of Stern Review Report, Global Energy Assessment and many other national and global reports. She served in the Steering committee of LOICZ. In her independent research capacity she has authored books and written over ninety articles in peer reviewed leading professional journals and books. She is interested in multidisciplinary approaches to understanding development issues. Current research interests are: Economics of Climate Change, modeling energy demand, economy-wide modeling exercises for deriving policy implications, water quality demand modeling, water pricing, urban infrastructure development policy issues, sustainable indicator estimation, natural resource accounting, valuing environmental services, and developmental and environmental issues relevant for informal sectors, Coastal Ecosystem service evaluation.